In comparison to regular glasses, safety glasses are designed and tested to meet safety regulations for enhanced protection. Safety glasses must have higher durability, the lenses and frames must be impact resistant, and they must pass a series of tests. Regular glasses to do not have these standards. The lens materials used in safety eyewear undergo numerous tests to determine safety classification and impact resistance. 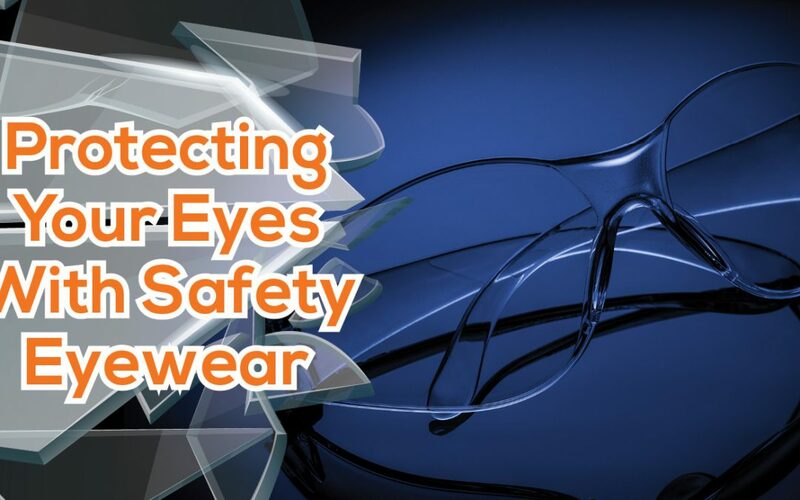 Safety eyewear commonly uses polycarbonate material for impact-resistant lenses. This material is half the weight of glass and makes for lighter and more comfortable wear. In most cases, safety goggles do not have prescription lenses and are used primarily for eye protection. However, goggles can be made with prescription lenses to accommodate those who need corrective eyewear. In the United States, the American National Standards Institute is the non-profit organization that sets the quality and safety standards for eye safety devices including eyeglasses, goggles, face shields, welding helmets, and full face respirators. The Occupational Safety and Health Administration (OSHA) is the department of US Department of Labor that oversees workplace safety. Your employer should inform you what type of safety eyewear you need for the job. Having a plus mark (+) on eyewear means the lenses passed the high-velocity test. Without a plus mark, they pass the basic impact test. (V) means they are photochromic and (S) means the lens has a special tint. The glasses marked with (V) and (S) protect your eyes from light damage when soldering, brazing, cutting, and welding. Z87 the frames pass basic impact. Z87+ the frames pass high impact. Z87-2 the frames pass basic impact and have prescription lenses. When do I need to wear protective eyewear? Some jobs require protective eyewear. A good rule of thumb is if you work in an area with loose particles, flying objects, chemicals, or dust, you should wear safety glasses. Some occupations have a higher risk of eye injury including construction, manufacturing, auto repair, electrical work, welding, mining, carpentry, plumbing, and maintenance. If you are working on repairs, renovations, painting, or yard work at your home you should wear protective eyeglasses. For home tasks such as mowing the lawn, trimming, and other power tool activities it is recommended to use frames with side shields to protect from flying particles and objects. Protective eyewear should be worn in a variety of sports. For active sports, elastic bands can help to secure the glasses on players’ heads. Athletes that participate in hunting or shooting sports should wear high impact frames and lenses, which protects their eyes from possible ricochet. Fish hooks can cause serious eye injuries; the best choice is a wrap-style frame with safety lenses. Protective eyewear can help to prevent eye injuries.